Miranda pleads for mercy for Fernando (right) but Prospero will have none of it. (From left) All eyes are on Gonzalo as he delivers his remarks to Alonso, Prospero, Ferdinand and Miranda. I WONDER if I was the only one who felt the urge to go pick up a copy of William Shakespeare’s ‘The Tempest’ after watching St Joseph’s Private School’s performance of the play. Standing in the St Joseph’s Cathedral car park after the August staging of ‘The Tempest’, my colleague and I talked about what we just saw and decided it was simply outstanding. On a remote island, the rightful Duke of Milan Prospero (Zachery Aw) plots to restore his daughter Miranda (Nicola Chan) to her rightful place, after they both were cast adrift by Prospero’s jealous brother Antonio (Annette Lee) 12 years ago. With the help of his magic and the air spirit Ariel (Gerald Kiing), Prospero conjures up a storm to ‘shipwreck’ his brother Antonio and a host of other wedding guests — Alonso (Geralyn Ting), the King of Naples; Alonso’s brother Sebastian (Chloe Chee); Alonso’s son Ferdinand (Eugene Thian); the honest old counsellor Gonzalo (Ian Chai); and two lords Adrian (Debbie Kiung) and Francisco (Meg Shim). We also meet Caliban (Devin Chee), Prospero’s servant and the son of the dead witch Sycorax. Caliban did not have a cordial relationship with the Duke and his daughter, so the exchange was verbally violent. Caliban hunches off to collect firewood. 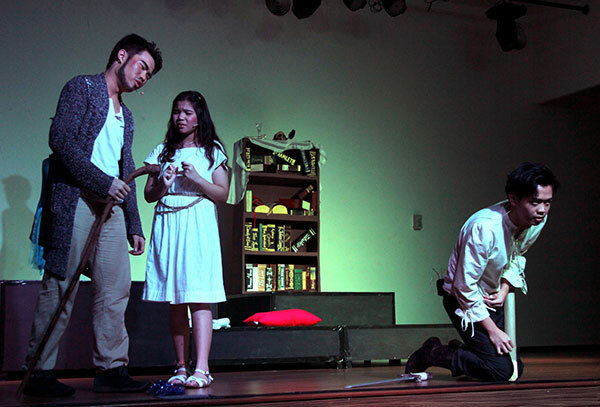 Prospero engineers a situation where Miranda and Ferdinand meet and fall in love. To test their relationship, he accuses Fernando of lying about being the Prince of Naples and takes him to prison, followed by a pleading Miranda. Meanwhile, the king and his party have assumed that Ferdinand is drowned and dead. Alonso wishes he never married off his daughter Claribel to the prince of Tunis, which necessitated the sea voyage that claimed the life of his son. Gonzalo is distracted by the nice island they are shipwrecked on, while Antonio and Sebastian verbally cut down his every comment. Ariel arrives bringing mischief, putting everyone except Antonio and Sebastian to sleep. Left to their own unguarded thoughts, Antonio persuades Sebastian to kill the king and seize the throne. Sebastian buys it but Ariel conveniently wakes everyone just as swords are about to descend. 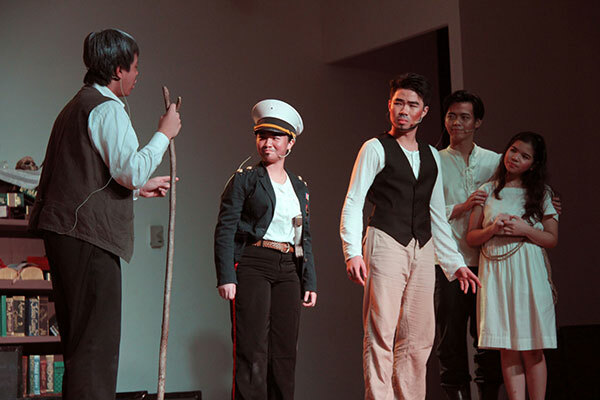 Elsewhere, ship jester Trinculo (Ryan Yap) seeks shelter from the storm together with Caliban, who thinks he’s being besieged by spirits. A comically drunken butler Stephano (Eddison Chai) arrives and decides that the Caliban-Trinculo creature under the cloak must be a monster who needs to be boozed up. Trinculo shows himself and soon, the three are happily swigging from the bottle and hatching plots of their own. Shakespearean plays are infested with long monologues and witty wordplay. Congratulations are in order for the cast, who must have spent weeks memorising lines and dispensing them out as their characters required. Having not met any of these youngsters beforehand, I had trouble remembering that they’re half my age or younger. But they lived and breathed their characters — Prospero’s charisma and menace balanced by fierce love for his daughter, Caliban’s manic energy and convincing animalism, the sweetness of both Miranda and Ferdinand, Ariel’s full spectrum of emotions. Stephano was also a clear favourite; drunken characters are always so much fun on stage. In the Elizabethan era when Shakespeare was popular, women were not permitted on stage so male actors also played the roles of female characters. In an amusing role reversal, a large number of the male roles in this production were taken up by the girls. The props department also deserves recognition for stunning work, especially on the bookcase in Prospero’s scene and the detailed banquet table in Act 3. Two copies of ‘The Tempest’ were visible as book props, as well as a number of other works of Shakespeare — ‘The Merchant of Venice’, ‘As You Like It’, ‘Hamlet’, ‘Anthony and Cleopatra’. The banquet table was laden with fruit, fowl and loaves of bread. If you are not familiar with the play, Prospero delivers a moving speech that very neatly concludes the play while acknowledging the audience. I’m not going to insult the cast and crew by saying that this production of ‘The Tempest’ was good for a school play. I’ve yet to see or hear of a Shakespearean production staged and performed by adults here, so this is my current benchmark. I would be more than happy to see others — schools or not — try to match this. 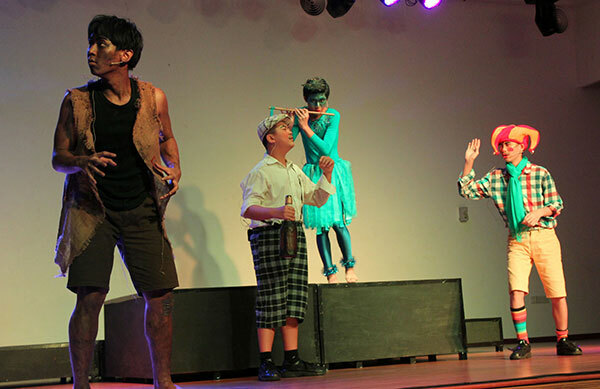 St Joseph’s Private School’s ‘The Tempest’ was directed by Cheryl Ann Teng, while the production manager was Ashley Yap. (From left) Caliban, Stephano and Trinculo try to figure out the source of the music. The crew of ‘The Tempest’ take their bow.